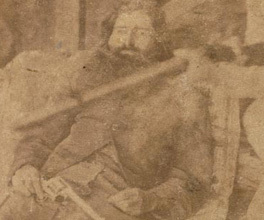 Like many bushrangers, John Fuller, aka Daniel Morgan, had a short but bloody career. Morgan was first convicted in 1854 by Judge Redmond Barry, who sentenced him to 12 years in Pentridge prison for armed robbery. He emerged from jail with a fierce hatred of authority that saw him become one of the country's most feared and hated outlaws. Morgan ranged far and wide across north-east Victoria, committing crimes against society in general, and police in particular. Angry with one overseer he felt was too friendly with the police, Morgan turned up at his homestead with the intention of shooting him. The man was away on a cattle drive, so Morgan demanded money from his wife, forcing her back against a blazing fire. When her clothes caught alight, Morgan waited a moment before throwing water on her. She survived but had severe burns to her back and legs. Another time, Morgan held up a group of workers and, realising that some of them were Chinese, forced them to sing and dance for him. He casually shot one of the men in the arm, who subsequently died of blood poisoning. On 8 April 1865, Morgan took over a homestead, holding the occupants hostage. When the maid slapped him in the face defiantly, Morgan was so impressed he let her go. She found one of the station hands and told him to ride for help. Nunn, H 1980, Bushrangers: a pictorial history, Lansdowne Press, Sydney, NSW. Just after sunrise, Morgan appeared, holding three hostages in front of him. Morgan was shot in the back and was quickly overpowered. He died soon after. After his death, Morgan was beheaded, and doctors shaved his head and removed the skin from his face to make a death mask for phrenological analysis. Some authorities protested because the death mask wasn't created in a controlled medical environment, but it was generally felt that Morgan's body was treated with the same respect he had shown for life. Despite his passion for cultural development, judge Redmond Barry was ruthless in court.